Fill Your Bags with Local Love at Fall Flea! This post is written by Maggie Mecklenborg, public relations intern for Experience Columbus. You can follow her on Twitter @maggiemeck. 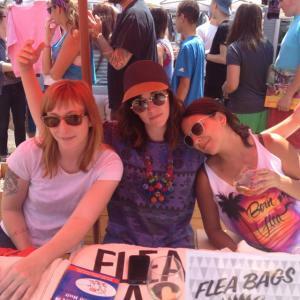 It’s that time of year again to grab your flea bags and head to the Columbus Fall Flea on Sunday Oct. 6, 2013 from 11 a.m. to 5 p.m.! During Columbus Fall Flea there will be 40 vendors offering a variety of antique goods such as original artwork, vintage clothing, vintage housewares, used records, used books, candles, handmade jewelry, antique furniture and leather goods and much more. Homage will be selling their t-shirts that turn back the clock with shout-outs to eclectic moments and personalities in sports, music, politics and popular culture, and Ghetto Vintage will also be participating by setting up their renovated camper full of vintage tees and other goodies! Some other noteworthy vendors include Candle with a Cause, Poor Sparrow Jewelry, and Ron House with his incredible vintage vinyl collection. House also holds a D.J. slot at the Fall Flea. “We took the market back down to about 40 vendors so we can make sure we keep a cool, fresh rotation of vendors. While there’s a sprinkling of the old favorites, there’s a really good feeling of newness and excitement,” said Nikki Portman, the creator of Columbus Flea. Seventh Son Brewing Company’s bar will be opened so that all of the flea-goers can taste their delicious and freshly brewed on-site craft beers. There will also be several food vendors including That Food Truck, which sources locally grown produce and grass-fed meats that are crazy fresh and crazy good. In addition, Freedom a la Cart, a delicious local food cart and catering business employing survivors of human trafficking will also be feeding the flea-goers all day long. And of course, Jeni’s Splendid Ice Creams along with J-Pops will also be at the event serving up your favorite desserts! For more information on featured vendors, event tidbits and updates about the Columbus Fall Flea follow them at columbusflea.wordpress.com, on Twitter @columbusflea and on Instagram @columbus_flea!